Summon: +1/+1 if you have an action in your hand. 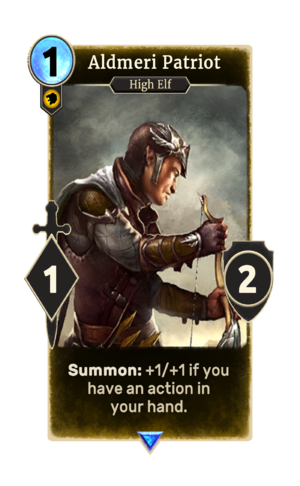 Aldmeri Patriot is a rare Willpower creature card. It is part of the Core Set. "Let my aim be true!" "I have an extra quiver, thank the Eight." "Your death will be auspicious." "Your breath shall join the winds." This card's summon ability applies the Aldmeri Strength card effect. This card is named after the Aldmeri Dominion, and depicts an Altmer with Altmer-style medium armor and weapons as they appear in ESO. This page was last modified on 15 February 2019, at 11:43.